Of all the epic adventures around the world, none quite compare to the quintessential African safari. Ask any intrepid traveler what their dream trip would be, and chances are a journey through Africa is bound to make an appearance—if not top the list. Between its mesmerizing sceneries, fascinating wildlife, and colorful cultures, it’s no wonder the continent has long lured curious sightseers from across the globe. There are 54 countries that make up Africa’s geographical footprint, but very few visitors ever venture beyond the borders of its star attractions, including iconic destinations like Maasai Mara National Reserve in Kenya; the Okavango Delta in northwest Botswana; and South Africa’s Kruger National Park. But for a truly spectacular experience that blends all of Africa’s charms with an off-the-beaten-path mystique, consider booking a flight to Namibia. From its vast and varied landscapes to its once-in-a-lifetime adventures, here are 10 reasons why your next escape should be exploring Namibia. One of Namibia’s most compelling features is the sheer diversity of wildlife that call the country home. Many first-time visitors get all but consumed with seeing the “Big Five” game animals: lion, leopard, rhinoceros, elephant, and buffalo. While Namibia is technically one of the few African countries that does offer sightings of all five, the chances of coming across each during a single trip are pretty slim. There are, however, plenty of other rare species worth seeking out. Examples include the puku antelope, cheetah, gemsbok, honey badger, ostrich, brown hyena, and more. On the coast, expect to see seal colonies, heaviside’s dolphins, and migrating southern right whales. 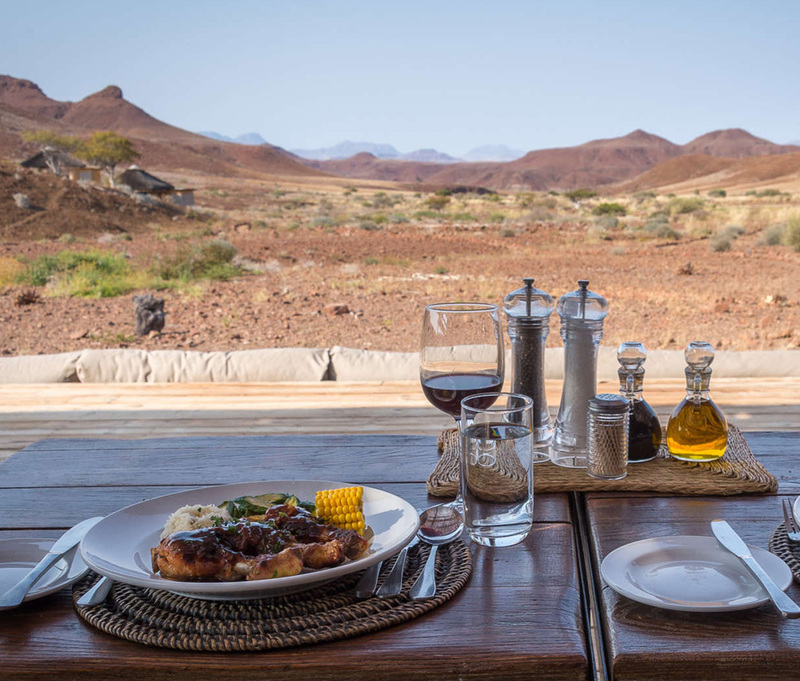 Whether you want to rough it out in the bush or treat yourself to a little bit of luxury, Namibia offers a wide array of accommodations dispersed throughout the country. It all just depends on what style you’re looking for. The isolated Hoanib Skeleton Coast Camp, for instance, offers eight solar-powered tents that overlook Kaokoveld’s harsh landscapes. At Damaraland Camp, guests can take a dip in the pool or relax in the open-air restaurant encircled by a chain of copper-colored mountains. For a lavish retreat, consider bunking up at one of the newly renovated chalets at Serra Cafema Camp, perched above the verdant banks of the Kunene River across from Angola. 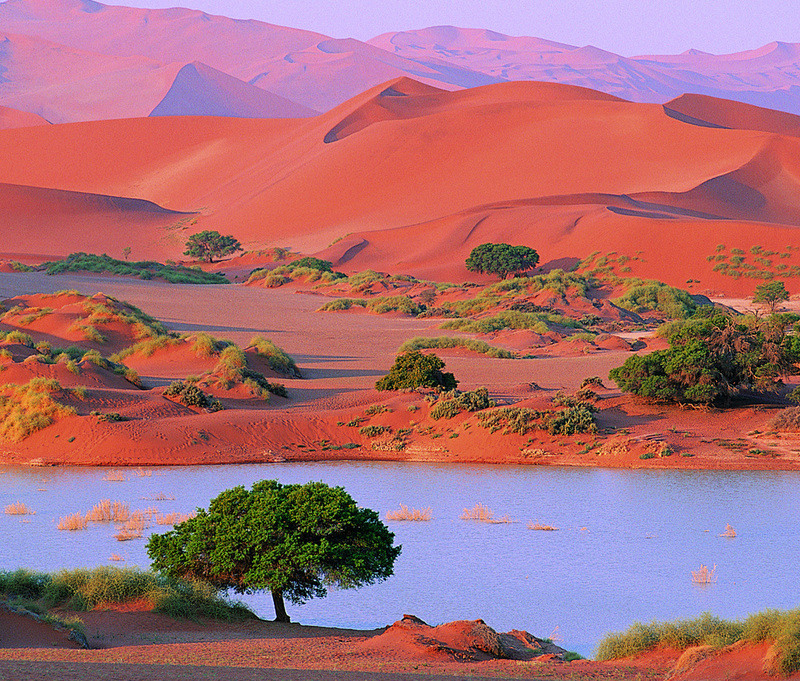 “We call Namibia the land of many faces,” explains Jimmy Limbo, an experienced guide and native Namibian. Locals also refer to the country as “the land God made in anger” because of its drastic, dramatic, ever-changing backdrops. In an instant, barren stretches of cracked, dried earth shift to reveal towering sand dunes that stretch up toward the clouds. Jagged black dolomite rock formations shine and sparkle beneath the overwhelming sun. Then, all of a sudden, a lush oasis springs to life, attracting hungry elephants, playful baboons, and flocks of rare birds in search of some respite. The rise of sustainable tourism is soaring to new heights, thanks to an overarching shift in the way people want to travel. As we collectively become more aware of the tourism industry’s impact on local environments and communities, we can make better decisions about the destinations we visit, the experiences we seek out, and the companies we choose to do business with. Wilderness Safaris, for example, is a leader in this space and has dedicated their purpose to conserving and restoring Africa’s wilderness and wildlife. 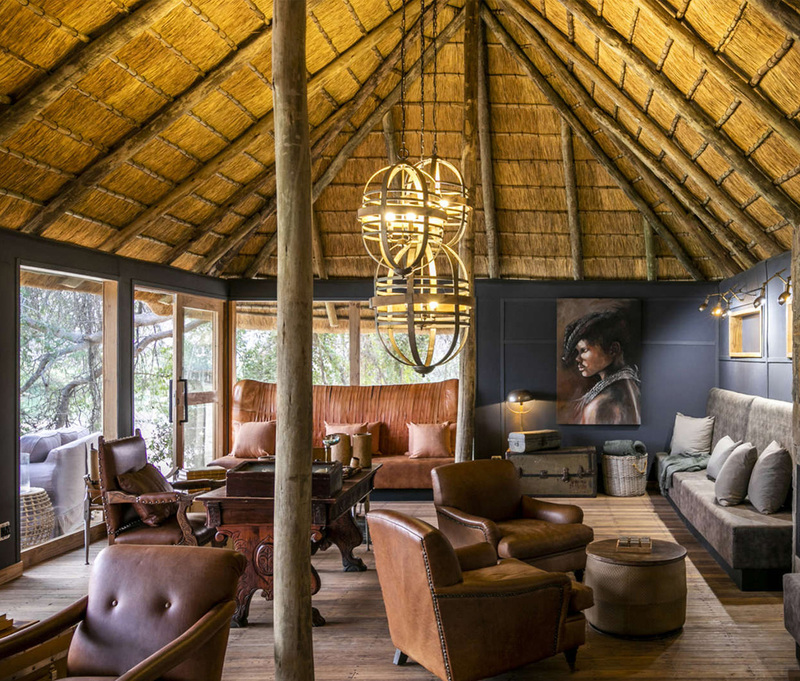 By leveraging a combination of world-class hospitality, eco-friendly practices, strategic partnerships, conservation coalitions, and philanthropic causes, they’ve successfully created one of the most responsible models of ecotourism in Africa. 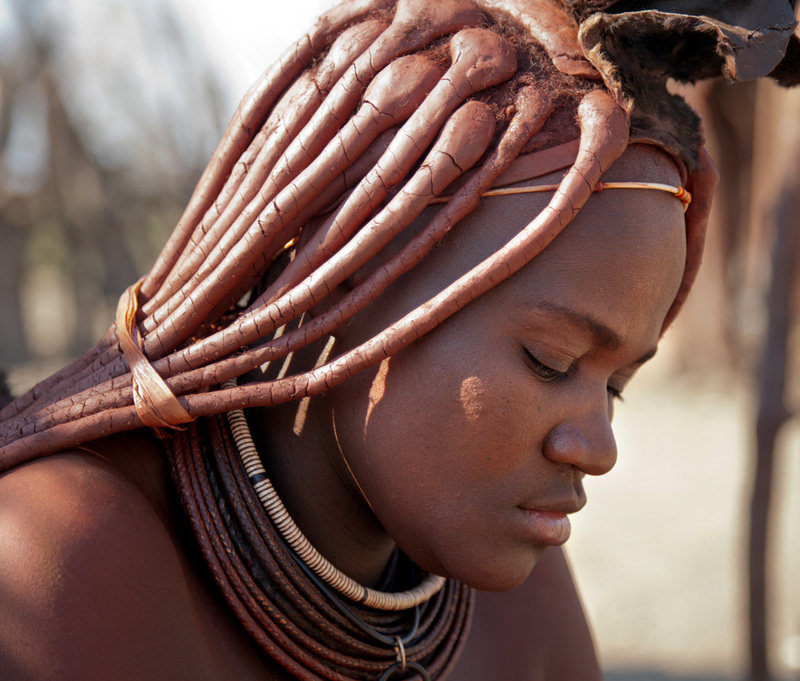 The Himba are a group of indigenous peoples that call northern Namibia home. Their population is estimated at approximately 50,000 and they’re considered to be the last of the country’s semi-nomadic people. Many of the Himba have completely avoided Westernization, but that seems to be changing as newer generations opt to embrace a more modern lifestyle. The Himba women are known for their striking appearance, which includes detailed clothing, jewelry, and intricate hairstyles (which are used to symbolize age, marital status, and social ranking). The Himba women also cover their skin with a red-tinged otjize paste made from butterfat and ochre pigment to cleanse their skin and provide protection from mosquito bites and the sun’s harmful rays. Yes, a game drive is thrilling; but in Namibia, there’s no shortage of truly epic adventures to keep your heart racing. Some even call it the most underrated adventure destination in all of Africa. At Serra Cafema Camp, guests can race Kawasaki quads through the labyrinth of desert dunes. Water sports like kayaking and canoeing are popular activities, despite the misconception that Namibia is one giant, dry desert. Opt for a multi-day adventure along the Orange River, which borders South Africa and is notably void of any dangerous species like crocodiles and hippos. Ramblers will also want to hike through Fish River Canyon, the second largest canyon in the world. But the ultimate adrenaline junkies should venture to Swakopmund for some of the best skydiving in the region. The food scene in Namibia is based on two main influences: the techniques and ingredients used by the indigenous peoples (like the Himba), and the cooking styles introduced during the colonial period from the German, Afrikaner, and British. Expect to eat lots of wild game, such as oryx, zebra, and even ostrich. These are typically prepared as steaks, sausages (boerewors), kebabs (sosatie), or stews (potjiekos). Lentil soups and side dishes are also popular, as are cornmeal-based recipes. But in Windhoek, Namibia’s modern capital city, visitors can find virtually every type of cuisine. Wash it all down with some Desolate Namibian Gin or one of their ubiquitous German-style beers, like Windhoek Lager. 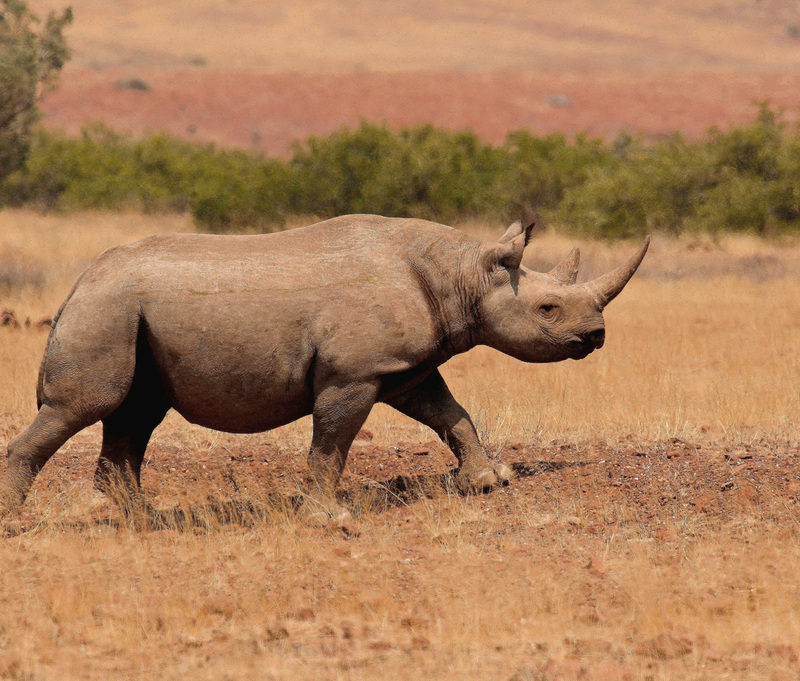 Of all the animals found within Namibia’s borders, the black rhino may just be the most prized. While thousands upon thousands once traversed the country, illegal poachers nearly drove the species into complete extinction. Thankfully, efforts were made to study, monitor, and protect the critically endangered species before they disappeared forever. Now, with populations on the rise, visitors can seek out exclusive experiences that actually help protect the population. For example, book at stay at the Desert Rhino Camp in the Palmwag Concession to track the animals on foot with the help of trained experts. Most people are so accustomed to light pollution they forget just how spellbinding the clear night sky can be. 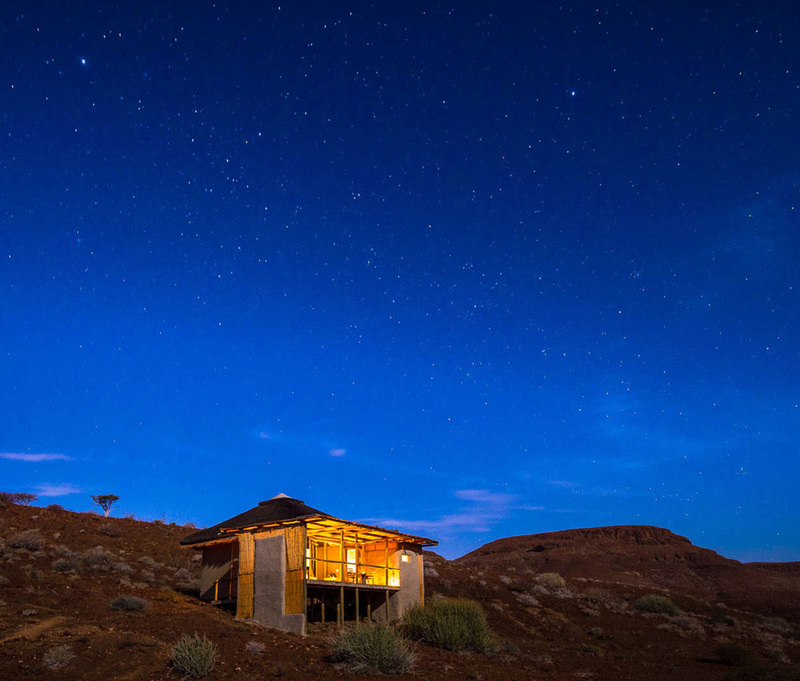 Namibia is counted amongst some of the top stargazing destinations on earth. Here, holidaymakers can witness cloudless skies illuminated by twinkling constellations and streaked with shooting stars. On especially clear nights, be sure to keep your eyes peeled for planets and Magellanic Clouds that pop up in the nightly masterpiece. Many camps and lodges even have special observation decks and offer telescopes for guests to use. When most people travel, they’re typically not off the grid. There might be faulty WiFi or spotty reception, but they’re not totally disconnected. Thankfully, that’s not the case in Namibia. Sure, the city of Windhoek is the main exception, but many of Namibia’s safari camps are tucked away in remote corners of the country where reliable internet connection and cell service is certainly not the norm. So your best bet is to take full advantage of the digital detox and truly enjoy being present in the moment. The social media posts can wait.